It has a fast work rate, is low maintenance with few wearing parts and enables overseeding to be carried without taking ground out of play. 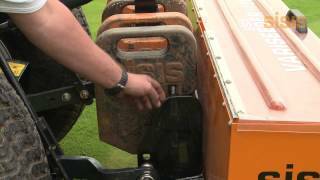 This grass seeder adaptable and can be used on a variety of sports fields as well football pitches. It can also be used as a lawn seeder. Its studded roller creates a seed bed and it comes with a storage trolley. 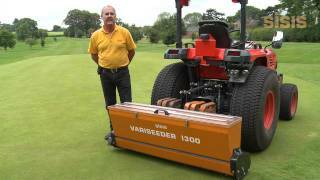 A demonstration of the Sisis Variseeder 1300 - a versatile easy to use tractor mounted seeder perfect for cricket ground maintenance. Seeding is vitally important to precisely position and then cover seeds to enable new growth and the SISIS Variseeder ensures the sowing and seeding process is efficient and effective. 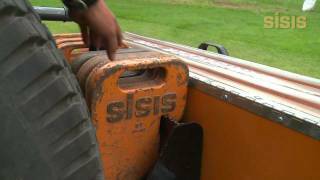 The SISIS Variseeder is a versatile easy to use tractor mounted seeder with a variable seeding rate ideal for sports field maintenance, golf course maintenance and for use on lawns and amenities. It has a fast work rate, is low maintenance with few wearing parts and enables overseeding to be carried without taking ground out of play.